When one imagines the stereotypical readership of Rolling Stone Magazine, one envisions a very different image than the stereotypical readership of Time Magazine. Magazines like Rolling Stone are connected with a younger audience that is more liberal and concerned with fashion and music. However, magazines such asTime typically attract an older, more educated audience that is seeking knowledge about the world. Advertisers are aware of these images and who will most likely see their advertisement, and present their product accordingly. Since Timemagazine appeals to an older, wealthier, and more educated readership, advertisers will gear the ads in this magazine towards these kinds of people. However, even though three advertisements for the same type of product may appear in the same magazine, the three different companies will each show their product in unique ways. 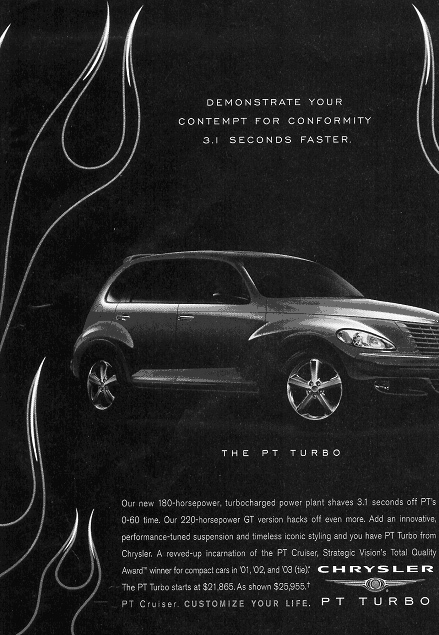 Advertisements for a Chrysler PT Cruiser (Exhibit 1), a Toyota Hybrid (Exhibit 2), and a Nissan Altima (Exhibit 3) all appear in Timemagazine’s September 15, 2003 issue. While these advertisements are all very different from each other, they try to appeal to the audience in similar ways. All three automobile ads use different themes and approaches to pathos, ethos, and logos to appeal to a similar audience. Pathos, or a pathetic appeal to the audience, plays on the fact that certain images and colors will have set effects on most of the people viewing the advertisement. In Exhibit 1, the use of color and the positioning of the car add to this effect. Exhibit 1 sends the image of being exciting, flashy, and on the cutting edge. This ad, which appears in a magazine for an older readership, Time, has a station wagon, which many older people can appreciate the usefulness of. However, it makes this old useful idea into something new and exciting. The blue flames and the blue color of the car against the black background certainly reinforce this idea. It gives the message that this car is not just a practical automobile but a stylish and exciting one, as well. The written words in the center, above the car, state that the person who drives this car is demonstrating“contempt for conformity.” This useful wagon is presented as thrilling and exceptional. Exhibit 2 also appears in the same issue of Time magazine, but it takes a different approach to pathos. This advertisement contains a lot of green and nature scenes, giving a soothing feeling. It associates the car in the advertisement with nature, making it seem like it belongs there. It appeals to the desires of those who are ecologically aware. The car isn’t really the main focus in this ad; rather, the nature scene takes up almost all of the space. Even the tire tracks that the car leaves behind are green, adding to the advertisement’s use of color to appeal to pathos. Exhibit 3, again in the same issue of Time magazine, also takes a unique approach to reaching the same audience. With regard to pathos, the car company Nissan appeals to the desire of people to want to be respected and admired. Nothing else is in sharp focus in this advertisement but the car itself. It is the main attraction of a busy city scene. This idea is reinforced with the written words “Blend Out.” The car is sleek, beautiful and at the center of attention. This ad conveys the idea that those who drive this car will be noticed and looked up to. In addition to pathos, credibility, or ethos, must also be established in an advertisement. Exhibit 1 does so mainly through the use of icons. In the bottom left corner is an icon that states the 7 year, 70,000 mile warranty. It is balanced in the bottom right corner by a “Total Quality Award” framed in a gold diamond. Since the ad is mostly black and free of clutter, the symbols stand out quite clearly to the viewer. Also, written in blue rather than white, and in a larger font, is a website where prospective buyers can find more information. When companies give phone numbers or website addresses, it adds credibility in that it shows the company is established and easy to reach. This given information supports the idea that not only will this company support its customers, but it is also unlikely to become nonexistent shortly after purchase. In Exhibit 2, ethos is established in the facts that the Toyota Company offers in its advertisement. While one page of the ad is devoted mainly to pathos and has a picture well- designed to evoke emotion, the other page offers information to the consumers. Like Exhibit 1, a website is also given on this advertisement. Considering the year in which this issue of Time is dated, 2003, a website is sufficient information, for computers are accessible to almost everyone interested in buying a new car. Especially since Time appeals to an older and more educated readership, these companies assume that computers are readily available to these people. Toyota also gives the reader of the advertisement facts as to the benefits of a hybrid car. The advertisement states the power and torque that a hybrid vehicle is capable of. It is easier for the viewer of the advertisement to believe it when there are facts to base their opinions on and this information is readily available. Exhibit 3 is also successful at establishing credibility in the advertisement. First of all, this advertisement also offers a website and a 1-800 number, giving a potential consumer two ways to feel secure and connected with the car company. Also, while the idea of someone standing out and capturing the attention of a group of people through their car might be far-fetched, credibility is still maintained. The setting is an ordinary setting, one that many business people or workers that read Time might see every day. Also, it is important to notice that while the car is the main attraction of the advertisement, all eyes are not turned towards it. The ad is more believable in that not everyone is blown away and staring at the car. 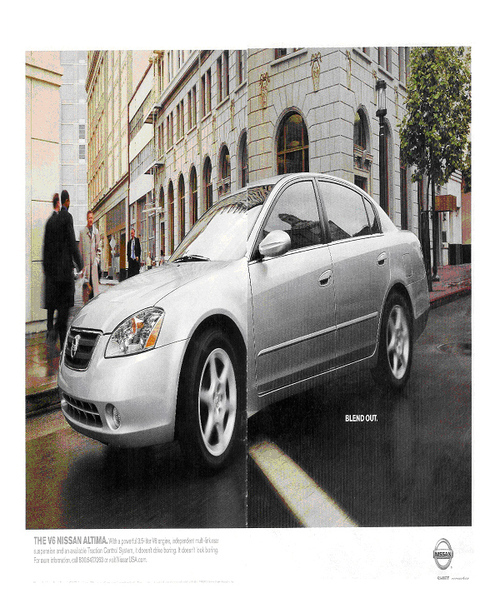 The ad retains the car’s image of being unique and standing out while still being believable to the viewer. All three of the advertisements are also successful in creating logos, or logical appeals, to the viewer. While Exhibit 1 has a lot of flash and glamour to it, logic is also an important part of the advertisement. First of all, the words in the middle of the ad tell of the Cruiser’s 180 horsepower engine and its superior suspension. These facts show that the car not only looks good but is a powerful car and of good quality. Another logical appeal is that the starting price is given. This part of the advertisement takes the economical approach and shows the reader the base price they can own this car for. This advertisement presents an evaluative argument that basically states that this car is the best a person can get within a certain price range. It gives ideas and pictures to try to convince consumers of this fact. In Exhibit 2, the logical appeal deals with the fact that the car is a hybrid gas/electrical vehicle. 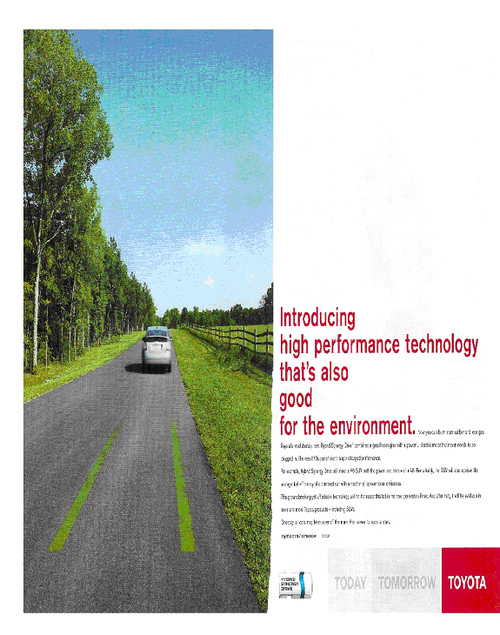 This is one of the biggest appeals of this advertisement, and even the large, bright red print states, “Introducing high performance technology that’s also good for the environment.” The logic here is that this car is much better for the environment than a normal car. Even the picture, as described before, is green and a nature scene. The words on the opposite page from the picture also tell not only of the ecological benefits of this Toyota but the performance enhancements and the gas conservation, as well. The issue year of the magazine is important in this advertisement. It is 2003, and gas prices are on the rise while the economy is sinking. Therefore, people are looking to save money on gas. This car offers the solution. Also, many people are aware of the problems of pollution and looking for a way to help. Lastly, the phrase “today, tomorrow, Toyota” also reinforces this idea of an ecologically sound car. It gives the idea that this car could lead to a safer and cleaner future than a regular vehicle. In this way, this ad presents a proposal argument. The problem is pollution, and this ad suggests that this car will help with this crisis and is by far the best car for the environment. Exhibit 3 addresses logos in a slightly different manner. The logos in this advertisement links to the pathos in that this ad is aimed at an older audience. The intended audience of this advertisement will want to stand out among their colleagues and friends. The car company tries to convince the potential consumer that this vehicle will help them achieve that goal and that it is a logical solution to the problem of wanting to be unique. It lets the viewer feel that owning this car is a good idea. Another approach to logos is found at the bottom of the ad, in the print. There are facts given about the size of the engine, its suspension, and its Traction Control System, which gives the person viewing the advertisement facts about the car and specific reasons as to why this car is arguably superior to others. This advertisement also presents and evaluative argument by conveying this idea. It presents evidence and pictures to convince the reader that this is the best car they can buy within this price range. The company uses pathos, logos, and ethos to strengthen its argument. The culmination of all of these elements formulates a successful advertisement. Color is proven to be very important in some ads. The time frame of the advertisement is also crucial to the effectiveness of particular ads. Every advertisement addresses the issues of pathos, ethos, and logos to appeal to the reader, but each does so in a different manner. While all of these advertisements are all aimed at the same readership, for they all appear in Time magazine, they all approach the same audience differently. However, one argument is not shown to be weaker than the next. All three of these ads target the public’s emotions, establish credibility, and show that buying the advertised product is a sensible thing to do.